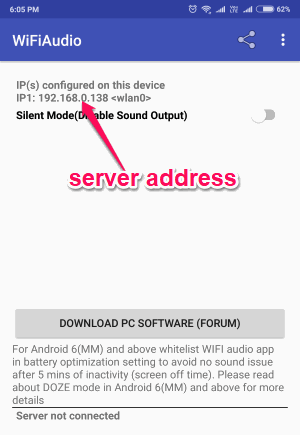 In this post, you will learn how to stream PC audio to Android. There are many methods available using which you can stream audio from your PC to your Android phone. The methods include various services which combine a desktop server and Android app, Chrome app and localhost URL, etc. connected to the same network. They are completely free to use and you can stream PC audio for as long as you want to your phone. That means they can turn your Android phone into a wireless speaker for your PC. They support many music services like Spotify, YouTube, SoundCloud, and even the audio players for Windows. In other words, you can stream any audio you want from your PC to your phone. After you connect your phone and PC via these services, you can mute the volume on your PC and stream a low-latency and high-quality sound on phone over WiFi. Let’s get started with the methods. SoundWire provides one of the best ways to stream PC audio to Android. It comes with a lightweight desktop client and an Android app to help you do the same. The output audio quality of this service is very impressive. 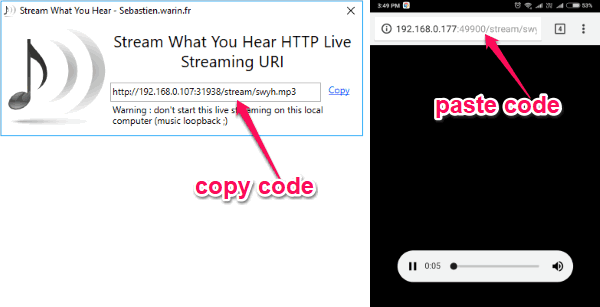 Just follow the steps below to stream audio from PC to Android. Step 1: To get started, the first thing you need to do is make sure your PC and Android phone is connected to the same network. 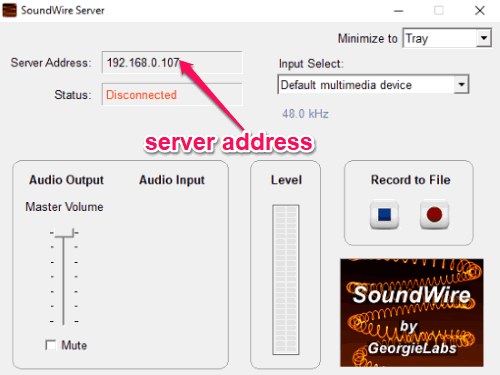 Then install the SoundWire server on your PC and the SoundWire app on your Android phone. After that, open the server and there you can see a server address at the top. Just take a note of the address. Step 2: Now, switch to your phone and open the SoundWire app. 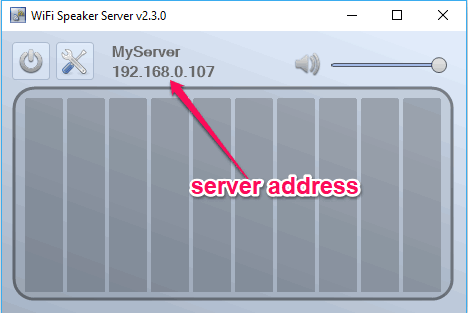 After that, you can see an input field named “Server” in which you need to enter the server address. Then tap on the “Coil” button and it will get connected with the SoundWire server on your PC. Step 3: After that, you can go ahead and play anything (like an audio or video) on your PC. Then you can listen to the audio right on your Android phone even if you mute the audio on your PC. On the desktop client, you will also see an option to control the master volume of the audio playing on your phone. 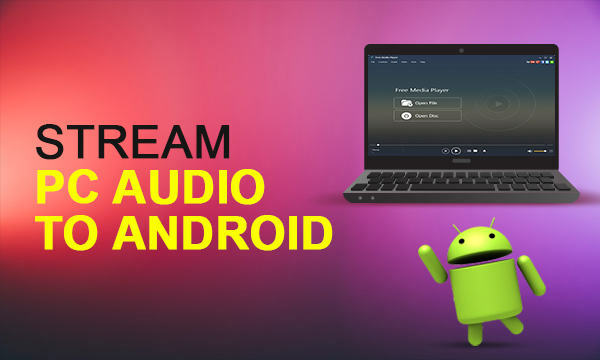 Stream What You Hear is also a very useful service which you can use to stream audio from your PC to Android. That means you can make your Android phone a PC speaker. This one uses a simple desktop client and generates a URL which you can use on your phone to start streaming audio from PC. For that, go through the steps below. Step 1: First, you need to download and install the desktop client of “Stream What You Hear” on your PC. After that, play anything you want on your PC and open this software alongside. Then you can see an icon on the system tray. 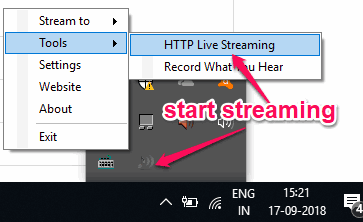 Right-click on the icon and select “Tools → HTTP Live Streaming” to start streaming the audio. Step 2: As soon as you do that, it will open up a popup window and generate a URL. Now, what you need to do is simply copy the URL and make sure that your phone and PC is connected to the same WiFi network. After that, open the browser on your Android phone and paste or type the URL. As soon as you do that, it will get connected to the “Stream What You Hear” server. Step 3: Now, you can start streaming PC audio to your phone with ease. That you can listen to the audio (or video) played on your PC directly on your Android phone. You can mute the PC volume if you want and the audio will still keep playing on the phone. SoundIt is actually a free Chrome app which can also be used to stream PC audio to Android with ease. It combines a Chrome app, a small desktop client, and a local host URL to do the task. You would need to simply follow the steps explained below and you can start streaming audio from PC to phone in no time. Step 1: To get started, you would need to connect your PC and phone to the same network. After that, go ahead and install the “SoundIt” app for Chrome. Then open it up and follow the guided wizard to set it up. In the first step, it will ask you to install a lightweight software called “SoundIt Enabler“. When you do that, simply go to the next step and click on the “Activate Sound Streaming” button. 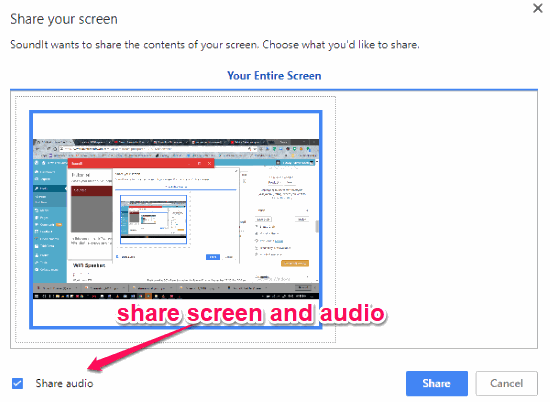 Then a popup window will appear and you would need to share your screen along with audio. Make sure to check the “Share Audio” option at the bottom. Step 2: Once you have done that, it will generate a server address which you need to use on your Android phone. For that, open the browser on your phone and type the address. As soon as you do that, your phone will be connected to your PC via SoundIt and you can listen to the audio or video played on your PC directly from your phone. 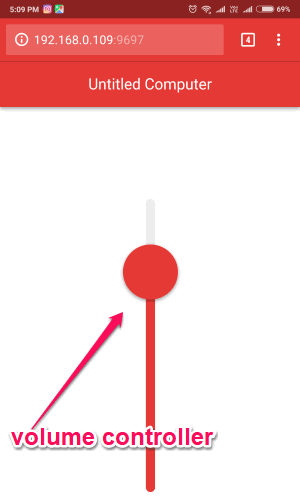 You will also see a volume control option on the page you have opened. 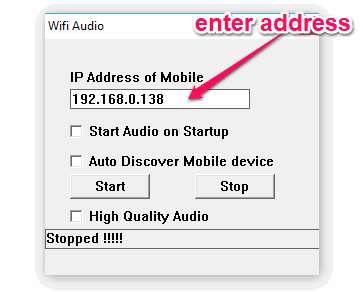 WiFi Speaker is another free service which makes it very easy for you to stream audio from PC to Android phone. Similar to “SoundWire”, this one also uses a combination of desktop client and Android app to help you stream audio. For using this service, go through the steps below. Step 1: The first thing you need to do is install the WiFi Speaker server on your PC and open it up. After that, you will see a server address at the top of the window. Now, install the “WiFi Speaker” app on your phone and open it. Step 2: After that, connect both the devices over the same network and enter the server address on the mobile app. When you do that, press the “Connect” button and a connection will be established. Now, whatever audio you play on your PC can also be heard from your phone. Wireless Speaker is the last service in this list which can help you seamlessly stream PC audio to Android. You would need to use the desktop client and an Android app to do the job. It lets you easily listen to the audio you play on your PC from your phone. To do that, you would need to go through the steps explained below. Step 1: First, connect your phone and PC to the same WiFi. To stream audio from PC to phone, simply install the Wireless Speaker app on your Android phone and the Wireless Speaker desktop client on PC. 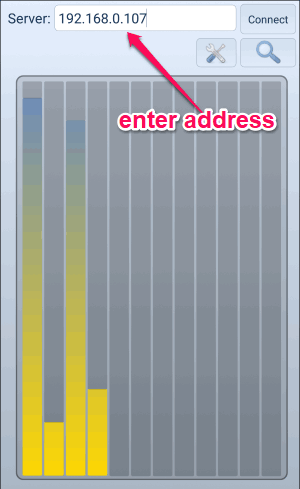 After that, open the app and you will see a server address at the top. 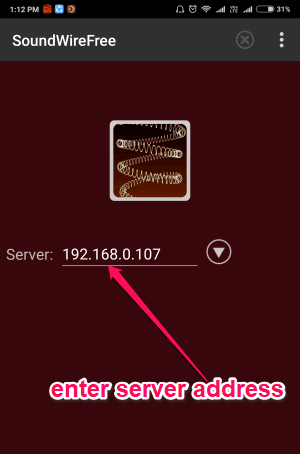 Step 2: Now, open the desktop client and enter the server address in the “IP Address of Mobile” field. Then click on the “Start” button and then you can start streaming audio from PC to phone. Whatever, you will play on your PC (like an audio or video) can be heard from your phone as a speaker. So, these are some of the best methods to stream PC audio to phone. All the services explained in this post makes it super simple for you to listen to the audio, which you play on your PC, directly from your Android phone. What I like about these services is that even though they are streaming the audio from PC to phone, the audio quality doesn’t get distorted.